A self-driving truck by Hyundai Motor completed a 40-kilometer highway drive south of Seoul, in the first successful test-run of an autonomous truck here, the company said Wednesday. The 40-ton Xcient, linked with a trailer, was operated with level 3 of autonomy at a maximum speed of 90 kph. The company applied differentiated sensing technology and a control system by attaching 10 sensors including three cameras, two radars and three lidar sets on the front. The vehicle -- 3.5 times longer and 9.2 times heavier than a regular sedan -- demonstrated that it was able to keep driving in line with traffic flow, recognize the movement of vehicles changing lanes, and stop and go in a congested traffic situation. The self-driving truck also passed through two tunnels, officials said. 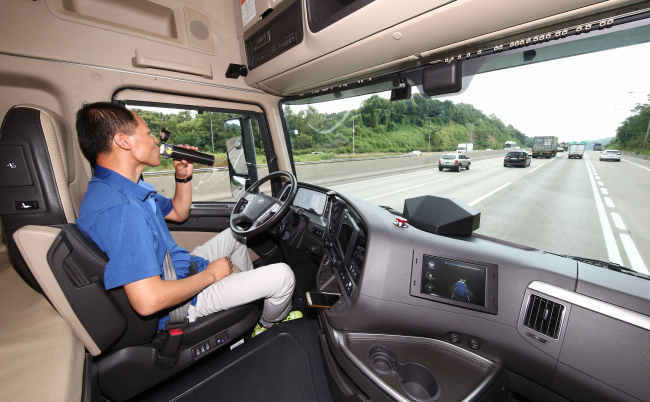 The truck had a man onboard as level 3 of autonomy requires human intervention. Hyundai said it believes that self-driving trucks will bring significant change in the transportation sector by reducing the number of traffic accidents as well as logistics and fuel costs. The company also plans to secure the necessary technology to make truck platooning possible after 2020. “Starting with this case, (Hyundai) will push ahead with developing platooning and a completely autonomous truck that requires no human intervention,” an official said.